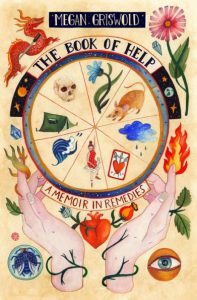 On November 26, 1940, cooking school attendees at the Capitol Park Auditorium in Olympia watched the play “Alice in Electric Wonderland.” In the story, Alice, disconsolate that her mother is too busy cooking to play with her, is brought by the White Rabbit to a place called Electric Wonderland. Accompanied by characters from Lewis Carroll’s classic tale, Alice watches a home economist cook a “Wonder Meal” on a Hotpoint Electric Range, showing her how efficient and cheap the appliance made cooking. Alice’s mother would have much more time to play with her if only her mother would buy this stove. 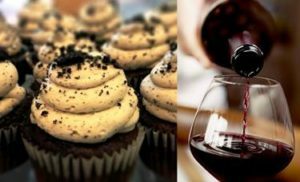 At the same time, attendees of the cooking school learned new recipes for things like vegetable soup, upside-down ham loaf, and golden mashed potatoes. 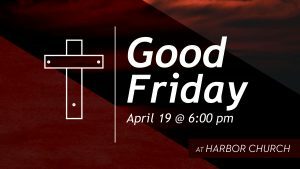 Unsurprisingly, the program was sponsored by Puget Sound Power and Light, the primary electricity provider in the region and the free tickets could be picked up at Olympia appliance dealers. By 1940, the concept of a “cooking school” was far from new. The first half of the 20th century witnessed a revolution in cooking. New technology and changing tastes effected the way people ate and thought about food. However, new cooking appliances were expensive. For example in the 1920s, refrigerators cost a quarter of the annual income of an average American family. 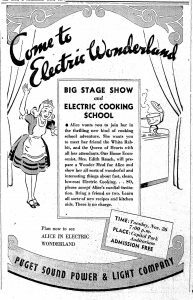 In 1940, women in Olympia could watch a play that showed Lewis Carroll’s Alice learning about the joys of cooking with electrical appliances. Daily Olympian advertisement, November 24, 1940. Women were reluctant to give up the wood stoves that they had learned to cook on for electric ranges that many could not truly afford. To convince them to change their minds, local companies and appliance dealers sponsored cooking schools across the country (including Thurston County) to teach women the wonders of the new appliances. 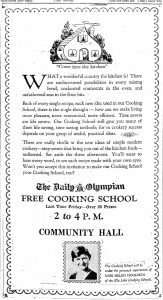 The largest local free cooking school was an annual one held by Olympian newspapers. First sponsored by the Olympia Daily Recorder and Morning Olympian, the papers combined in the 1920s to become the Daily Olympian. They sponsored a three-day cooking school in 1913, and then held the event annually from 1925 until World War II. These large programs were held in local movie theaters, including the Liberty, Capitol, and Avalon. 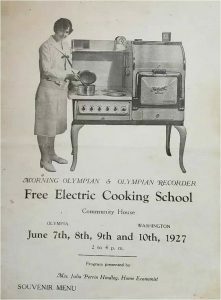 Several hundred women would attend the three-day sessions to listen to college educated home economists hired by the Olympia Light and Power Company (later Puget Sound Power and Light) teach them about cooking with electric ranges. These home economists cooked on stage, showing women the wide variety of recipes that could be prepared electrically. In 1927, for example, themes included: Baking Made Easy, Home at Six O’clock and Dinner, Bread and Rolls, A Planked Fish Dinner, and Cakes for all Occasions. The newspaper printed souvenir recipe booklets for attendees. Being sponsored by the local newspaper, the annual cooking school was heavily promoted in the paper. Local businesses and national companies were eager to inform readers that their products were used in the cooking school. These included community businesses such as the Capital City Creamery, Mottman’s Mercantile, LeMay Meat Market, and national companies like Leslie’s Salt, Crisco, Ghirardelli’s Chocolate, Fisher’s Flour, and Frigidaire. Businesses also provided prizes for winners of the pie and cake baking contest that usually ended the event. By the later 1930s, the American Legion women’s auxiliary helped organize the event. The Great Depression hurt cooking schools. With most people having trouble just putting food on the table, few had the money to spend on fancy kitchen appliances. Teachers emphasized that electrical cooking saved money (after paying for the range itself) and offered more prizes. Organizers also tried more original ideas to bring people in. In 1940, they even showed the feature-length film “Blame it On Love” along with the sessions. The film was a musical sponsored by Edison General Electric Appliance Company. A manufacturing heir elopes with a nightclub singer Terry Arden. 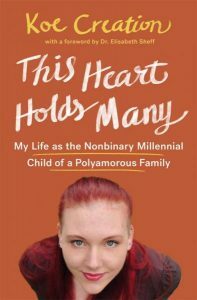 Terry is unable to cook and the couple separates. Helped by a cooking school teacher, she learns how to prepare a prefect meal with a Hotpoint stove. Using her new cooking skills, Terry wins back her husband and also earns the approval of her in-laws. This film has been preserved and put online by the National Film Preservation Foundation. The local newspaper’s cooking school ended with World War II as manufacturers switched from consumer goods to war production. After the war ended, stores often had one day “schools” with company home economics representatives giving demonstrations to visitors with enticements of free recipe booklets, prizes, and refreshments. For example, in 1954, a Westinghouse Company representative gave a presentation (“Tomorrow’s Cooking Today”) at Selden’s Furniture. The Daily Olympian cooking school returned for three years (1956-1958) at the Community Center (former USO Club) as one-day events sponsored by Olympia appliance dealers and Puget Sound Power and Light. Cooking schools as promotions for electrical cooking appliances faded after the 1950s, as these appliances became standard. However, the schools left a legacy of changed attitudes towards cooking and helped popularize electrical cooking equipment that most Americans take for granted today. Cooking classes, however, have never disappeared and are still available through community organizations including city parks departments.